Biking on Milwaukee Avenue. Photo by Steven Vance. 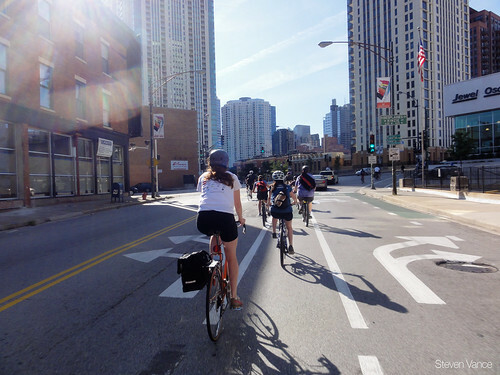 The Chicago Department of Transportation has added many miles of protected and buffered bike lanes across the city, but it can be challenging to find space for protected lanes on the streets where they are needed the most. CDOT has implemented “road diets” on several streets, replacing excess car lanes with protected lanes, which has the added benefit of reducing speeding and shortening pedestrian crossing distances. The Dearborn two-way protected bike lane, through the heart of the Loop, is the most notable example of this tactic. 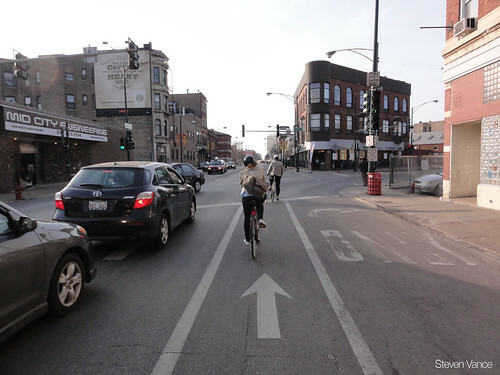 Now CDOT is considering taking a somewhat bolder step by removing parking on sections of Milwaukee Avenue, Chicago’s busiest bike street, to make room for protected lanes between Elston Avenue and Kinzie Street. Milwaukee’s junctures with North and Chicago avenues are two of the city’s intersections with the most bike crashes, so protection from car traffic would be a huge benefit for cyclists. This stretch of Milwaukee also serves as a connector between existing protected lanes on Elston and Milwaukee. However, CDOT project manager Mike Amsden explained that because this segment of Milwaukee is 50-to-52-feet-wide and has significant bus and truck traffic, it’s considered too narrow for both protected lanes and parking lanes on each side. “On a 52-foot roadway you can fit ten-foot travel lanes, eight-foot parking lanes, a three-foot buffer and five-foot bike lanes, but that’s pretty tight for a street with heavy truck and bus traffic,” he said. He added that there are currently so many bike riders on Milwaukee that wider bike lanes are needed so that faster cyclists have plenty of room to pass slower ones. 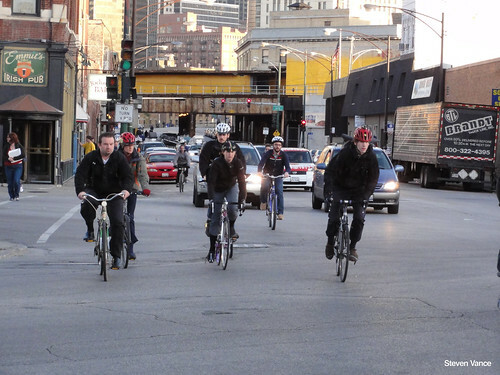 Cyclists waiting to turn left onto Kinzie from Milwaukee. Photo by Steven Vance. While Joel Mangers, director of Intuit art center, 756 North Milwaukee, said he would not want parking removed from his retail-rich location, he’d support removals in low-demand areas, like the desolate stretch near the Ohio feeder to the Kennedy Expressway, to make room for protected lanes. “Anything that slows cars down is a good idea,” he said. “I’ve seen so many bikes almost taken out by cars.” He noted that that last summer speeding cab driver John Kesse fatally struck pedestrian Eric Kerestes as he sat on a bench across the street from the art center. Turning right from Milwaukee onto Elston. Photo by Steven Vance. Tim Coonan, owner of nearby Big Shoulders Coffee, 1105 West Chicago, agreed that parking removals would work on the low-density stretches of Milwaukee and said protected bike lanes would be a big improvement. “I’m a cyclist myself, and this part of Milwaukee is pretty much of a dragstrip for cars,” he said. “And as a business owner I want to get people to slow down, not only for safety but also so they notice local businesses.” He added that most visitors to his cafe, located next to a Blue Line station entrance, arrive by bike, on foot or by transit. The Active Transportation Alliance has started an online petition drive to endorse CDOT’s proposal, collecting over 1,400 signatures in favor of consolidating parking to make room for protected lanes. “We believe there’s support for this from residents and business owners in the neighborhood, so this is an effort to give a voice to this support,” said Lee Crandell, director of advocacy campaigns for the nonprofit.